The German retail industry has 17 companies on the Deloitte list of the top 250 global retailers. German's 17 retailers account for 9.6% of the revenue of the top 250 global retailers. Germany is part of the "Big Three" of the European economy along with the UK and France. Below are the top five Germany-based retail chains that were ranked as being among the top 250 retail chains in the world, in terms of revenue. It is worth noting that the 2018 Global Powers report is based on the fiscal year 2016 revenue figures. The revenue growth for the previous five years is also included. German company Schwarz Group ranks as the fourth largest retailer in the world based on 2016 revenues. The retail store operator's revenues grew at an annualized rate of 7.3% from 2011 to 2016. Next is the Aldi Group, which ranks eighth among the 250. The chain's revenue grew at 7.7% for the five years leading up to 2016. Third is Metro Ag, which ranks sixteenth out of 250 and operates in 30 countries. Fourth is Edeka Group, with the supermarket ranking nineteenth and growing revenue at an annual rate of 2.5% in the five years after 2011. Fifth is the German supermarket Rewe Group, ranks twenty-second among the 250, but posting negative annual growth for 2011-2016. Despite the strong presence of German retailers on the global list, there are few German retail brands that will be recognizable to the average American, with one notable exception. The no-frills Aldi grocery store chain has taken the American food retail industry by storm. One U.S. retail brand that is noticeably absent from the German retail landscape is Walmart, which tried to set up shop in Germany but ended up closing all of its stores there. Germany is one of the few markets where Walmart has proved that there's no such thing as "too big to fail." The German retail industry is experiencing drastic changes in brick-and-mortar retailing due to shifting consumer preferences. 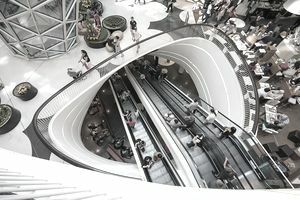 Entire chains and retail store segments are disappearing partly because of decreased consumer demand and partly because of consumer preferences to purchase merchandise in different ways. Just like in the U.S., music stores, bookstores, and consumer electronics stores are struggling and going out of business. Also, in alignment with the U.S. retail industry, department stores in Germany are struggling to remain relevant and profitable. The big retail disruptor for all of these failing retail segments is the Internet. And while a shift to Internet shopping doesn't have to mean the death of a retail company, unfortunately for many German retail companies it does. Still, the industry saw record growth in 2017 thanks to high employment and rising wages. One big trend driving the industry is the fact that many young people are moving from the countryside to urban areas. Internet and mail-order businesses drove the growth last year.